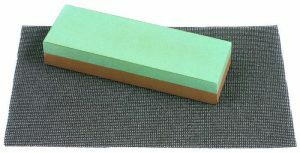 When sharpening tools with straight cutting edges, it is essential that the sharpening stone is completely flat. Check that the stone is plane by placing the edge of a ruler (No. 707290) on top of it. If light shines through at any point, the stone is uneven and must be ground down using one of several methods. The easiest of these is truing with a diamond lapping plate (No. 705429 or No. 711613). You rub the well-soaked stone in circles on the lapping plate until the surface is level. Light surfaces show the even areas of the stone, while the darker areas have not yet had contact with the truing block. Repeat the process until the surface is all light, constantly flushing off the paste. As an alternative, you can use a truing set (No. 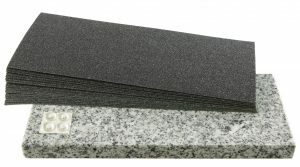 711115) with 100 grit water sandpaper placed on a flat granite stone plate. A specialized truing grille(No. 711297) functions similarly.